On July 13, 2018, around 12.15 p.m. the "Rossini" upon entering the new lock in Brunsbüttel for the eastbound transit of the Kiel Canal suffered a rudder failure in the fore port of the lock. The ship got perpendicular and remained in situ, being advised to wait for the assistance of the tug "Bugsier 18" (IMO-No. : 9036246) before entering the lock where the incident was investigated. The ship had sailed from Rotterdam on July 12. The ship berthed in the inner port of Brunsbüttel and sailed again on July 15 at 1.20 a.m. and resumed the voyage to Antwerp, ETA July 16. 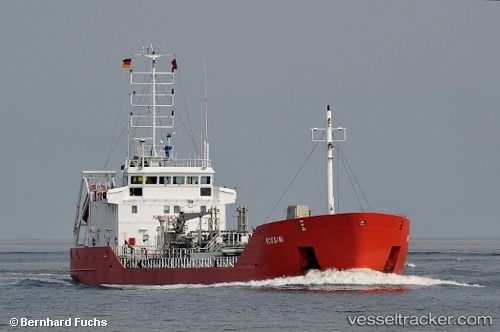 On Feb 15, 2017, at 9.10 p.m. the "Rossini", enroute from Moerdijk to Wismar, suffered a damage at a fuel pipe and was emergency stopped by the crew during the eastbound transit of the Kiel Canal at km 59. The disabled tanker ran into the northern embankment of the canal near Westerrönfeld. The canal traffic was barred between Schülp and Schacht-Audorf until a tug pulled the ship out. After a repair the ship was allowed to continue the transit to Kiel where it berthed at the Bominflot bunker quay at 1.40 a.m. for surveys. It left Kiel at 3.40 p.m. after surveys and docked at berth 1 in Wismar on Feb 17 at 6 a.m.